- Heating is a must if you wish to avoid the harshness of stone cold tiles in winter. You can set on/off times throughout the day or control it manually or by a thermostat. These systems add value to your home and cheap to run due to their low watt usage. The Hotwire system is the simplest to install and perfect for a DIY project. It is the only system that can be installed into small spaces so you have no cold spots. The kit includes a fully SAA compliant heating element and programmable touch screen thermostat/timer controller. Full DIY installation instructions and videos are available - or we have many recommended installers Australia-wide. Earn $21 Reno Dollar for purchasing. The Hotwire In Screed Heating kits are the most versatile on the market. As the wire element can be coiled into narrow spaces (which is not possible with wire-on-mat systems) you get no cold spots on your floor. Maintenance free - Once installed it is maintenance free. Many homeowners believe that -floor heating is not necessary when they are installing other home heating solutions. This is simply not the case - whilst - heating can be used to heat a room, it can also be used to simply heat the floor. Have you ever been in a traditionally heated tiled room? The room feels warm at head height, but the floor is cold and it is not comfortable walking in bare feet. Under floor heating can be your entire heating solution, or it can simply augment your other heating systems. Did you know that ducted heating can cause a temperature difference of up to 12 degrees between the floor and ceiling? Heating heats uniformly from the floor to ceiling and will also save you hundreds of dollars in the long run compared to bathroom heat lamps. As a total bathroom heating solution its running costs compare very favourably to other heating solutions such as heat lamps - see below. 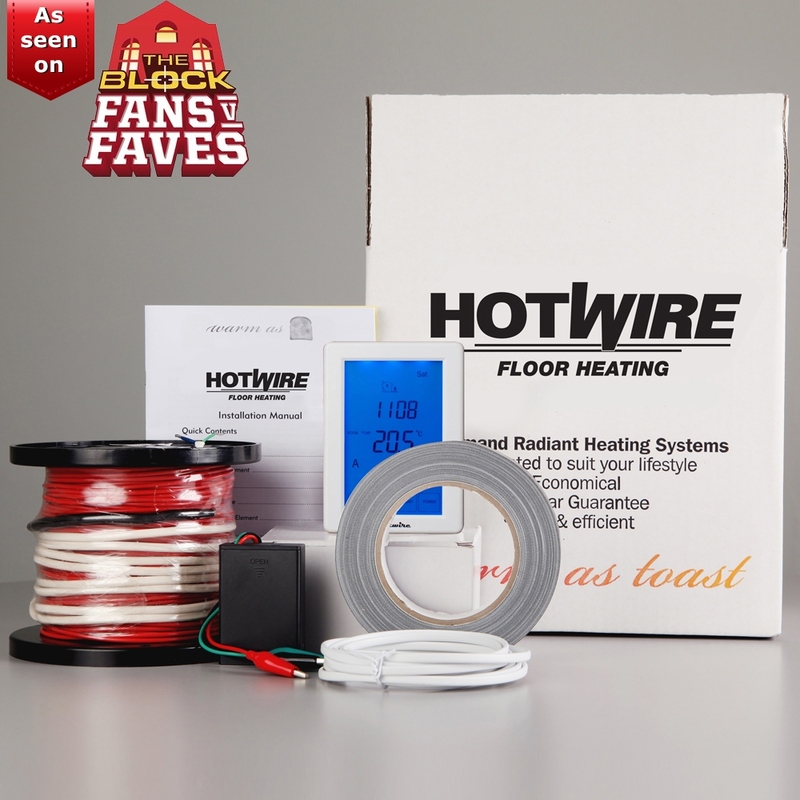 Unlike many other under floor heating products that are expensive to buy, install, run and maintain, the HOTWIRE In Screed Heating DIY kit enables you to do most of the work yourself and will only need the service of an electrician to connect the controller to the power once the hotwire has been laid. The flexibility of using a coiled wire verse a conventional heated mat makes installation so much easier, especially when laying in small tricky spaces around toilets and doorways. 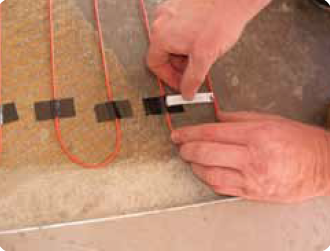 The heated HOTWIRE coil can simply be laid down on your homes substrate and taped in a coiled design before laying tiles on top. Therefore, your room will be warmed evenly leaving no cold spots to freeze your toes. Hotwire is one of the leading heating systems provider for Australian homes. Their variety of home heating products provide comfort and practical solutions to the customers' needs. Hotwire heating products are also affordable, making it possible for every home to enjoy the warmth their innovations bring. What's in the In Screed heating kit? The primary benefit of our HOTWIRE Under-Tile Heating DIY Kits is the ability for it to be installed almost entirely yourself. Due to Australian standards, a licensed electrician must connect the thermostat to the power source, however, this is the last step and the rest of the installation can be done yourself. With our in-depth and easy-to-follow installation instructions, save yourself hundreds of dollars by installing the product yourself! The installation process involves priming your floor surface and simply coiling your HOTWIRE around your entire floor surface at even intervals before taping down in place. All tape, wires, and necessary installation equipment are included. How to measure your floor? The length of your HOTWIRE In Screed Heating coil is based on the square meterage of space that you would like to cover. Generally, this doesn't include the area under fixed units such as vanities, cupboards, baths etc. Once the square meterage of the room or space you want to heat has been determined, select the corresponding range in the product options section and your price will be calculated. For example, say your bathroom is 4 square meters but with a permanently fixed vanity and shower, only 3 square meters of tiling will be pulled up. You will select the 2.00 - 3.10 range from the product options drop-down box. The calculated price includes all of the installation hardware within the kit as well as the touch screen thermostat. Hotwire provides a generous 10 Year manufacturer’s warranty on the heating cable and a 2-year warranty on the thermostat/timer.